MEMOFIN - Waivers from Pre-trade Transparency - L'information financière que vous ne trouvez nulle part ailleurs ! 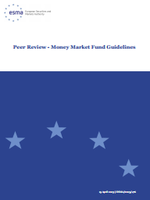 Under the Markets in Financial Instruments Directive (MiFID), operators of Regulated Markets (RMs) and Multilateral Trading Facilities (MTFs) must make public the current bid and offer prices and the depth of trading interests in respect of shares admitted to trading on a regulated market unless exemptions apply. However, MiFID allows competent authorities to waive the obligation for operators of RMs and MTFs regarding pre-trade transparency requirements for shares based on the market model or the type and size of orders.